The Networks Financial Institute (NFI) at Indiana State University was founded in 2003 through a grant from Lilly Endowment Inc., an Indianapolis-based, private philanthropic foundation. NFI strives to facilitate broad, collaborative thinking, dialogue and progress in the evolving financial services marketplace through student programs and research and thought leadership. NFI is a leader in preparing students for careers in the financial services industry. 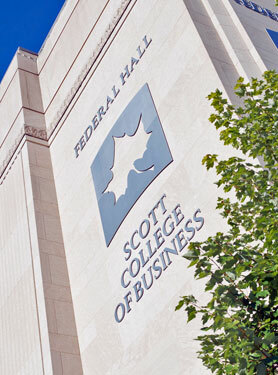 Through the Networks Professional Development Program, we’re committed to developing tomorrow’s hardworking, knowledgeable, inquisitive and respected financial industry professionals by preparing selected high-potential undergraduate business students at Indiana State University through scholarship, professional development and experiential learning. As a formal capstone learning experience of the Networks Professional Development Program, each spring junior scholars are responsible to design, organize and execute a conference on ethical decision-making and social corporate responsibility. This conference provides a rich opportunity for students to stretch, grow and develop practical leadership, managerial and teaming skills while addressing a major educational need identified by industry leaders. Hundreds of students and professionals participate in this annual conference and, each year, new levels of success are reached.